Q1: Is Porridge and Rice a feeding charity? No, Porridge and Rice is NOT a feeding charity - it is an education charity. Based on data collected by the World Bank, the WHO and the UN, education is the most effective, long-term and sustainable way to combat poverty. Nelson Mandela summed it up beautifully when he said “Education is the most powerful weapon which you can use to change the world”. In 2013, when investigating the needs of schools in the Nairobi slums, each school stated without hesitation that it is not possible to teach a hungry child. As a result, when Porridge and Rice made the decision to leads by implementing a feeding programme when first engaging with a school. In addition, because of the priority given by schools to combating hunger for their pupils, the charity chose to take its name from the feeding and nutrition programme. Once the feeding and nutrition programme has been implemented in a school, Porridge and Rice works on rolling out the other 6 programmes in an order that matches the greatest needs of the schools and the resources available to the charity. As the charity grew in size and experience, the programmes were expanded and refined. For example, the feeding programme developed beyond hunger to address a range of serious nutritional deficiencies such as Vitamin A, Iodine and Iron, so was renamed the feeding and nutrition programme. This programme now operates to combat hunger, enable healthy physical development, strengthen immune systems, and improve academic performance by achieving peak cognitive potential. Porridge and Rice now supports five schools, all of which are in different stages based on when they partnered with Porridge and Rice. 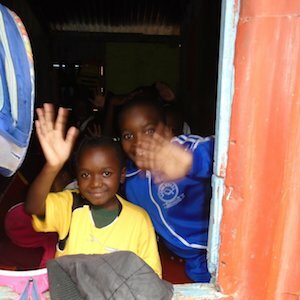 The goal though for each school remains the same – to enable the children of the Nairobi slums to obtain a sound education that will enable them to break out of the cycle of poverty and deprivation. Porridge and Rice seeks to improve the lives of some of the world’s poorest people in a sustainable and long-term way. Q2: Why the Nairobi slums? There are many charities operating in Kenya, in fact, most organisations like the UN claim that there are more charities per person in Kenya, than any other African country. The vast majority of these charities are in the rural areas or in Kiberia, known as the largest African slum. They do wonderful work reaching people in great need. Kiberia is famous because of its history and size, but what most people don’t know is that there are many slums around Nairobi, some as poor and some far worse. Because of the lack of infrastructure and the constant inflow and outflow of people, the actual number of people living in the Nairobi slums is hard to determine with estimates ranging from 1 to 4 million at any one time. The most consistently cited statistic is that 95% of the inhabitants of Nairobi live on 5% of the land of Nairobi. 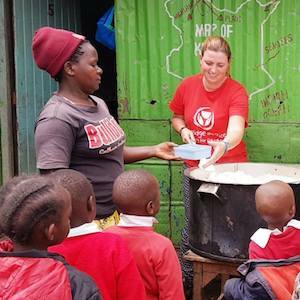 Because they are largely unknown outside of Kenya, there are very few organisations helping in slum areas besides Kibera. For this reason, Porridge and Rice decided that it would focus on slums where there are no other charities working to support education or at most one or two with limited reach. The charity made the conscious choice to focus on schools in slums receiving little to no help. For example, two years ago Porridge and Rice partnered with Compassion school in Githogoro because it found no other charities operating in the slum and the inhabitants of the area are extremely poor, in fact, Githogoro is the poorest slum that Porridge and Rice has encountered to date. The slum grew out of collapsed coffee plantations with many of the workers choosing to remain in the area rather than return to their rural homes. Over the last 5 years, the slum area has halved in size while residents have increased as land around it has been sold to the wealthy for expensive homes and apartments. The reduced area and the steady inflow of people means that the population density of the slum is rising steadily. Open defecation is the only option for most residents and water has to be brought in Gerry cans by hand or on bicycles. Unemployment is high, officially estimated to be around 40%, but in reality, probably closer to 80%, and life expectancy is lower than in the rest of the country. In essence, conditions and quality of life are dire. Porridge and Rice has paid for a water line to be installed into Githogoro for the use of the school it supports, and shares this with nearby residents. The only other water line that the charity is aware of, is owned by a local church which lock it so no one else can use it. City water is not reliable going off at least once a week but thanks to water tanks funded by Fonthill, Compassion school has clean, safe water at all times as do the residents supported by Porridge and Rice. Other activities done by the charity are providing sanitary pads to girls to enable them to stay in school, running a feeding programme for the pupils, teaching local parents how to keep Kienyeji chickens for profit, teaching hygiene to children and the community, providing toothbrushes to pupils courtesy of Operation Brush, and running numeracy training courses for teachers. The charity does much more and has plans to do even more like installing solar power for lights and hot water and building school toilets when it has the money. 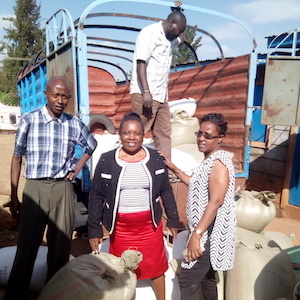 Porridge and Rice currently operates in 4 slums – Githogoro, Ngando, Mithonge, and Kawangware – all of which have no charities (in one case just one) operating in the area. All of these slums are extremely poor with Githogoro the poorest. The charity has over 100 schools on its waiting list, half of which are in slums which are very poor and where there are no other charities operating. Porridge and Rice will expand to these areas as its finances allow. Q3: Why does the charity not build brick school buildings? When founding the charity, a major goal was to buy land and build solid brick schools. There is something very pleasing with having something physical and visible that one can point at. However, the more that was learned, the clearer it became that the purchase of land and school buildings would not be the best way to meet the goals of the charity with the funds available. With one exception (Kibera), the slums by their very nature are transient, especially those where Porridge and Rice operates. They move, not in days and weeks, but in years and decades, as businesses and suburbs encroach on the areas they occupy. For example, in the 4 years since the charity was founded, land around where Lizpal school is located has been sold to build expensive modern flats. It is estimated that the school’s current location will remain for somewhere between 2 to 5 years at the current rate of development in the area before it is sold to developers. Porridge and Rice nonetheless remains fully committed to Lizpal school. Firstly, because a lot of lives can be changed in a few years, and changing lives is the charity’s priority. Secondly, because even though the area may disappear there is no reason for the school should disappear. When the time comes, the charity will help the school to relocate to another area and continue to serve the needs of the very poor. Thirdly, because the charity can find no other charities in the area supporting education for the local residents of the slums – Porridge and Rice operates in slums where there are no other education charities present, or in exceptional cases, one maybe two. Porridge and Rice has made a conscious decision to operate in the poorest slums because this is where the need is the greatest. The poorest slums are often the most transient so by definition, Porridge and Rice will find itself operating in transient areas. It is important to note that transient slums exist for several years, so it is possible to make a real difference to the lives of many people before they are forcibly moved or squeezed out by developers. Buildings, especially brick buildings with modern facilities, are relatively expensive. A decision to invest in land and buildings would take money away from other programmes as well as cutting the number of children that the charity supports. Porridge and Rice considers providing girls with sanitary pads to stay in school, training teachers to perform first aid to ensure the basic safety of children (one child nearly died when choking because teachers did not know what to do), providing clean water for drinking and hand-washing, all to be a higher priority than building nice buildings. Not making buildings and land a high priority in Porridge and Rice does not mean that the charity cannot point to clear, demonstrable results of the work it does, and to this end, the charity collects and reviews data about the children – they are, after all, the purpose for its existence. Since it has been operating the charity has seen a dramatic improvement in child health and development, significant academic improvement among pupils such that the charity’s schools regularly outperform many local government schools, teacher attrition dropping to close to zero bringing stability to the schools, absenteeism close to zero with schools having to send children home when they are sick, and more. These are all measurable positive results of which the charity is very proud. The charity has chosen to make changing lives its priority in combating poverty and deprivation, and while it would be wonderful one day to buy land to build schools, this cannot be a high priority in the transient Nairobi slums until the charity is a lot wealthier because this would reduce the number of children that the Porridge and Rice could reach. The charity’s goal is to enable as many of the children in the slums as possible to gain a sound education without compromising its strong principles.